There are 2 advantages if you grow herbs indoors, first you can eat the tasteful fresh herbs and second you can keep the flavor in your home. You can grow herbs in pot in your kitchen. 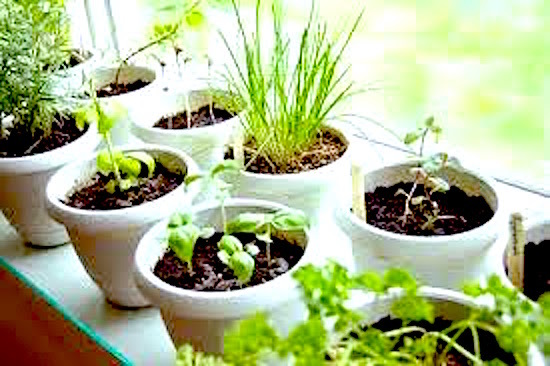 If you will start herbs garden in your kitchen, especially you are beginner, It is recommended to start from easy to grow herbs indoors, healthy plants are preferable than seeds. After you have some insights then you can try to grow herbs from seeds. It is common fact that usually herbs grown indoors are less productive than outdoor plants, but don’t worry the herbs will still give you plenty of fantastic flavor for your favorite dishes. Farming In City! Farming Without A Field! Is This possible? It is not only possible, but it is a growing movement in Udaipur. Shikshantar, a community organization, has been working with interested individuals to produce fruits and vegetables at their homes. Healthy, holistic living is rare in the city, but now a clean, self-sustaining city is possible and growing our own food is a major step in this direction. Welcome to Plant-Care.com newsletter. Here’s what’s been happening over the past few days. Your comments and feedback are always welcome. Establishing a herb container garden for your home not only gives you the chance of growing fresh herbs year-round for a assortment of uses, in addition it provides an eco-friendly method of decorating your patio, sunroom or balcony. Using ornamental ceramic pots, clay urns, wooden window boxes or any distinctive item that can serve as a plant holder for your herb container garden will add color and fragrance wherever you decide to place them. Instead of planting a big outdoor herb garden consider planting one indoors. Many smaller varieties and dwarf varieties of herbs grow quite well in small pots that can be placed on a kitchen window sill. Now when you are cooking you do not have to run to your outside garden to pick a few herbs to add to your cooking. You can just simply turnaround and grab a few leaves! It’s easy to grow your own indoor herb garden. Many kits are available that have everything that you need to get started. Look for the chia herb garden which is a fun way to get the kids involved too. You can enjoy the same benefits that you would outside, but with a few distinct advantages with an indoor herb garden.